Over the summer I encountered some shooting situations that were really tight. Basically, I needed to place cameras where either a tripod wouldn’t fit, a magic arm couldn’t be mounted, or a camera—even something as small as the TM900—wouldn’t fit. Enter the GoPro. When I discovered this last June, the most current model was the Hero 2, which offers 1080/30p and 720/60p, along with wide-angle and normal fields of view. The extremely small size would allow me to mount them virtually anywhere, and I was really impressed with the quality of the video they put out. After long deliberation, I sprang for one. I was especially excited about the $99 remote control add-on, whose packaging claimed that I could go to the website and download an app for my Android phone/tablet that allowed remote control and monitoring on the phone/tablet. These solved two big problems that I anticipated with the GoPro: first, that there is no built-in screen to see what you’re shooting, and secondly, that I would likely be placing the camera out of reach and wouldn’t be able to start it recording. I got the camera home and was extremely disappointed when I found out that the app was not available—the claims on the packaging were a lie. I was not happy at all. But I had a shoot that same day, and decided to take the GoPro along anyhow and see what I could manage to do. I was impressed with the footage I got. I shot indoors at the wide angle, and it turned out better than expected. But what really struck me was how good it looked outdoors, with lots of light. The GoPro really shines outdoors with plenty of light—which is what it was made for, I suppose. The next day, I returned the remote control, letting the people at Best Buy know that the GoPro packaging was completely false (which they seemed bewildered at), and picked up an add-on battery for extended life and a handful of different mounts. 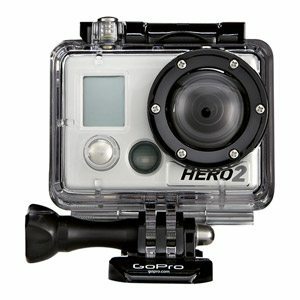 That’s another strong aspect of the GoPro cameras: there are tons of different mounts available for just about any situation, and it’s very easy to swap them out. My only complaint in this department is the massive price tag on these pieces of plastic. All in all, I love these cameras. So much that I bought a second one. I’ve used them for event shoots, underwater, on roller coasters, biking, interviews, and much more. Not only are they a cool novelty, but they shoot excellent video that has definitely added value to my productions. Watch sample videos on the GoPro channel on Youtube.